Enter desired quantity of each item and click "Place Order" to complete your order. Don’t be shy about letting your neighbors and passer-by’s know your home is for sale. 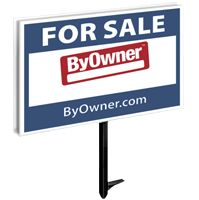 A For Sale By Owner Yard Sign (FSBO Sign) is one of the most effective tools in finding a Buyer for your home. Did you know that over 51% of all Buyers are found by the Yard sign? A FSBO sign is one of the most economical methods of marketing your home and could make the difference between finding a buyer or not. For this reason, don’t skimp on a cheap hardware store sign. A homemade sign or faded used sign could even steer Buyers away from your home Many Buyers peruse neighborhoods in search of available properties causing them to question how serious you are about selling. If you are in lightly trafficked neighborhood make sure you take advantage of directional signs For Sale By Owner signs to help Buyers find your property. You will need a sign for each turn off of the main road which leads to your street. It is more likely your buyer will come from your For Sale By Owner Yard signs than from a printed publication, open house or a most other marketing efforts. ByOwner offers two types of signs; heavy duty aluminum panel signs on one inch steel posts and coroplast 4 mill weather proof directional signs and open house panels with heady duty ¼ inch wire stakes. Video on how to install your sign. Click here for video.